Bath FC sounds like the rugby club, we do need the suffix. Have to disagree with Ken about the Southgate centre. It is so much nicer than that awful 60s atrocity that was there before. Interesting that they mention student accommodation but there isn't a quote from Ken about that. Don't worry Ken it has been made with such cheap tatty materials it will soon be looking appropriately shabby. At least the old Southgate was concrete. The new one has shop fronts made of plyboard that already look fit only for firewood. In 20 years time the whole place will look truly awful and run down, probably filled with short term low cost rented units. Marc Monitor wrote: Have to disagree with Ken about the Southgate centre. It is so much nicer than that awful 60s atrocity that was there before. It might be a pastiche and not imaginative, but I agree with Marc that it is an improvement on the awful 1970s construction that was there before. I remember Southgate Street in the 1960s with the Odeon Cinema opposite the Forum. I remember too the old waste ground where the old bus station was built. I think there were fairs held there, but there certainly were fairs on the old bomb site where they built the Technical College. Then home to Lower Swainswick for lunch. c.1.30pm Walk or cycle with friends to Twerton Park. 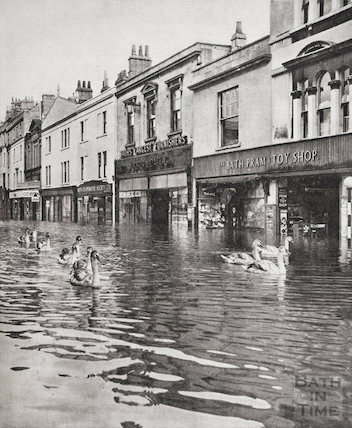 I also remember Swans on the floods in Southgate Street. Ah, a fellow ABC Minor! Yes, I remember that too and 78rpm records with record player needles making the crackle. Marc and Roy can only dream of music like that. Plunging into my memory cells how about John Collier(tailor); Hands Dairy(Abbey Green-dairy, Tiani's ice-cream); Evans Fish & Chip shop(conveniently placed adj to my old school Weymouth House aka Bath Technical School); Spears slaughterhouse on the other side, heard pigs squealing all day long. All these around the same area. Gotta go as the game is starting up. I remember a great shop where I could get Larry cakes. I can remember having a drink in the Edinburgh Castle pub - around the bus station side of Southgate. Even worse pub than the Livingstone in Moorland road! If you want independent shops then come to Bridport. 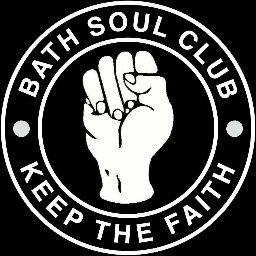 Bath City FC is one of the few beacons of community initiative left in Bath. I remember the floods in Southgate Street and rejoiced when I saw them, for it meant that I could not get to my hated Oldfield Boys' school. pete mac wrote: Remember the Edinburgh. I was going to ask about Larry cakes but assumed everyone would know! What about the 'South Pole' and the 'Wine Vaults'! I used to like the old Southgate Centre (Our Price Records, Ozzie Bailey, Menzies etc.) it was good until the early 90s but after that all the shops started to close down and it ripped the soul out of the place. My Gran worked down the Odeon for years ... during the war she used to sell Woodbine Cigarettes to Emperor Haille Selassie (His Imperial Holiness, The Conquering Lion of Judah, King of Kings of Abyssinia, Elect of God Jah Rastafari) ... A small, unassuming and friendly fella apparently.